Cold is a relative term. What's cold here, barely freezing, is a pleasant day in other parts of the country. However, after warmer, rainy days during which the sun sulked away behind the clouds, I am thrilled with cooler, clearer skies. My energy levels bounce upwards and people smile more. I'm also more motivated to take photos. We went for a walk on Saturday afternoon around the bog. Thin ice covers some of the water. Watching the ducks land on the ice proved entertaining, especially when one foot suddenly broke through and coasting changing to paddling. The robins are back. They don't stay away from here very long. Tim spied this one up in the tree. American robins, as they are known, are different from the European robins and belong to different families. Can you tell I received a bird identification book for Christmas? Dry grasses and bare trees make for an austere landscape. Austere, but lovely in its sparseness. Cold or warm, however relative the terms, I hope that you're finding bits of beauty in your world today. Are you gearing up to watch Downton Abbey's fourth season? Sharing with Mosaic Monday, hosted by Mary, and with Sunlit Sunday (the first of the season), hosted by Karen. So enjoyed this lovely post for its beautiful images of our feathered friends, and for all the interesting info! Hmm. I'm going to Google European robins as you have now sparked my curiosity! Yup, DA is tonight. I hear it doesn't start out so great but the season ends well (from a friend who watched it all online already). Your pictures are good and I know what you mean about feeling invigorated by the cold weather .. I think it's partly the drop in humidity. It was pretty humid here last week and rainy--we call it "soup." But now it's frigid and most welcome! Have a good week! We read today that Downton Abbey will be finishing. The Christmas edition left us longing for more! As you know, it should be quite a few months before I spot a robin in my area. That's one of the things I like about visiting other blogs, seeing what life is like in other parts of my own country and in completely different ones. The mallards look like they're having a pleasant swim and the tree may be leafless, but that just allows it's strong and flexible structure to shine through. PS: Downton Abbey is on my list of things to enjoy this evening. Fantastic pictures. I especially love the robin against that beautiful blue sky. Yes, temperature is all relative. John told me that he could feel the "warmth" on his face today. Really? 12F? I don't think so. Course, he's the only one going in and out so perhaps he can tell the difference between -22F and 12F, It's a significant one. Yes, I am so excited for Downton Abbey, Is Elizabethd from the UK? Does she know something we don't know? Ha! Lorrie, what a pretty blue sky. Love your duck and robin shots, enjoy your new bird book. Have a happy week! I'd willingly swap our milder but very wet weather for some of that cold blue sky kind. Lovely photos. Our robins are much smaller than the American ones and very cheeky and tame too. Lucky you to be seeing robins! I heard a couple of days ago that robins here in Ontario are having a difficult time with our nasty winter this year! Sure was frosty this morning here. We've been seeing a fair share of robins down here, too. Yes, I'm getting ready for season 4! You will put your new bird book to good use I bet! I love taking photos of birds. Lovely images of your feathered friends. I am definitely ready for season 4 of Downton Abbey. Happy New Year! 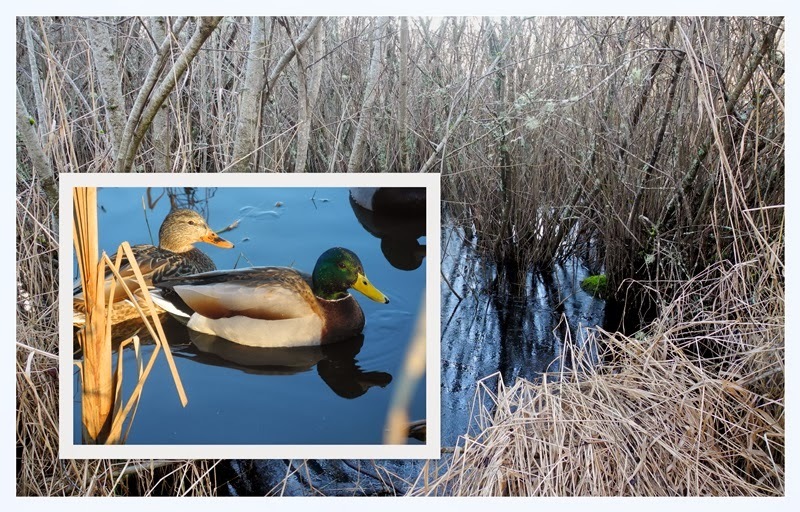 Your pictures are beautiful and the placement of the inset photo of the mallards is just perfect. I have a bird ID book, too and just love it. it certainly looks like a good day for a walk. Your last images reminds me of Australia! Is there no snow in your part of the country? I am hoping Downton Abbey will be returning to our television for season 4, but I heard a rumour that it will not! What will I do? I might have to buy the dvd! Even during cold weather, you have demonstrated that there are pretty scenes! Yes, we're all ready for tonight's episode of Downton Abbey. We'll watch the first half and record the second half, since it goes on past our bedtime. Ok..I have heard so much about Downtown Abbey,,,and I have to say I know nothing about it! Yikes! I love your simple and serene pictures...super cold here today....-30ish! Brrr. Stay warm! Usually we have a few robins stay over winter but they must have known about the amount of snow we'd have this year and flew south. I am ready, Downton Abbey starts in 10 minutes. Will you believe that I haven't watched the season finale from last year yet...I wanted to leave it as a refresher. It's been beautiful the last day or so, hasn't it?! I'm a bit nervous, though, when it's a bit icy as the docks here aren't always salted in time and I can easily picture myself sliding right into the cold saltchuck! I've just bought a Season's Pass to Downton Abbey on iTunes -- can't wait 'til the first episode is available there tomorrow. . .
Oh great photos - hasn't this sunny, chilly weather been fabulous - we spent two days getting some wonderful photos. I'm always happy to see the robins - I love their morning and evening songs. Enjoy your new bird book. Your first photo is my favourite, Lorrie. I know how you must treasure sunny days as a pleasant change from overcast days of winter. Nice to see an early robin and I heard yesterday that some daffodils are popping up in Nanaimo. How wonderful! Thanks for dropping in and leaving a comment on my blog recently Lorrie. It's always nice to meet someone new and our worlds couldn't be further apart. I've had a quick look at your blogs - so clever to have more than one. Love the recipe one . I'll be having a better look there when I have more time. Looks like you are a clever photographer and living in such a beautiful part of the world you have lots to photograph too. Lovely photos. Yes we watched Downton Abby and the next series we are waiting to start is Sherlock. Oh no! I was gearing up and have just realized I completely forgot to watch it last night. Too busy getting the Christmas decor put away, I guess. The scenes from your walk are lovely. Always nice to see the robins with their promise of spring's arrival. EVERYONE must be watching this Downton Abbey! I need to check it out. Lovely photos of your sunny days there Lorrie. It's nice to see the robins are back for you. I hear some haven't left here yet but the majority won't return until April. I don't get to see Downton Abbey on our TV but I did get to see the last 3 seasons on DVD. I'm sure it will be interesting, as always. Have a great week! Yes, we all watched Downton Abbey last night! But it got our first day back to (home)school off to a very slow start. My student did not want to get up this morning. Oh well...it is a rainy and dreary here and we're not going out today, so we'll just meander through our tasks, sipping tea as we go. Downton is sure to be a smashing season. I wonder if O'Brien will ever return. Ah, just as it is here today; in the tweens, but not a cloud in the bright blue sky. If the sun is shining I'm happy no matter the temps. I recorded Downton and will watch mid week when I have the house all to myself. If I am able to hold out that long! I love Downton. We are obsessed and have watched Season 1, 2, and 3 all over Christmas break again. I always order the DVD and it comes in early February so we avoid watching until then and watch it all in a binge in one or two evenings. Nice shots. Really like the mosaic with the ducks. A DA fan here also, I have already seen the first few episodes of season 4, but will be watching them again. Beautiful mosaic of the ducks and birds in the beautiful blue sky. I am sure you are much colder than we are but the sky is lovely on these cold crisp days. We just had a foot of snow here with record freezing temperatures on the way of 0 degrees F but I am hoping with the cold the sky will look like yours! A lovely post Lorrie and your photos are wonderful. Your part of the world has such a feast of birds so I imagine a bird identification book would be most useful. Our birds seem very dull after seeing your robin and other images on bird lovers blogs. I'm visiting from Sunlit Sunday today - I'm so glad Karen is back for 2014! I watched the season 4 premier of Downton Abby last night --it was a little confusing with so many different story lines, but I imagine they will all come togehter soon. Looks cousy there , here we are still waiting for snow and winter . we are cold here...and i mean just plain cold! Downton Abbey was wonderful. I am looking forward to the rest of the season. Lovely photos - I've been taking a few of the garden and birds from the window this morning............it's SO COLD here! Woke to 6F (-14C). Coldest temps. in NC since 1994, and quite dangerous out there - school started 2 hrs. later despite no ice. Funnily the sun is shining boldly, birds are flying, squirrels are hopping - and both are at the feeders of course..........and I'm here inside freezing to the point Bob ventured to the potting shed and brought me the little portable heater to put next to my feet! I'm wearing 2 prs. of socks and leg warmers too!!!! Our HVAC is pumping madly, we pray it doesn't quit on us even though we know it's aging and should be replaced soon - a big, messy future expense. We allowed the faucets to drip through the night too - don't want frozen pipes. Off to make another hot drink/hand warmer!!!! Great photograph the contrast of the Robin against the sky.